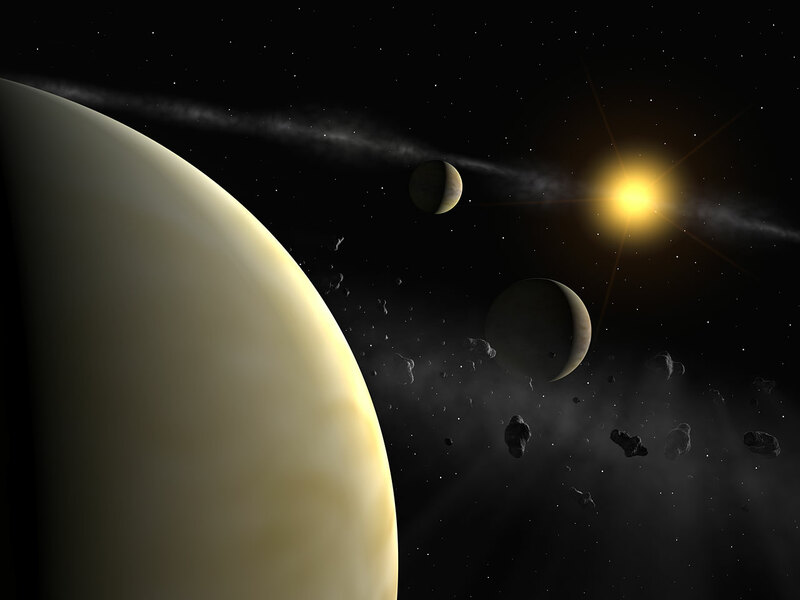 "For the first time, we have discovered a planetary system composed of several Neptune-mass planets", said Christophe Lovis, from the Geneva Observatory and lead-author of the paper presenting the results . During more than two years, the astronomers carefully studied HD 69830, a rather inconspicuous nearby star slightly less massive than the Sun. Located 41 light-years away towards the constellation of Puppis (the Stern), it is, with a visual magnitude of 5.95, just visible with the unaided eye. 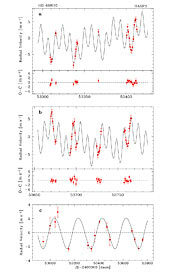 The astronomers' precise radial-velocity measurements  allowed them to discover the presence of three tiny companions orbiting their parent star in 8.67, 31.6 and 197 days. 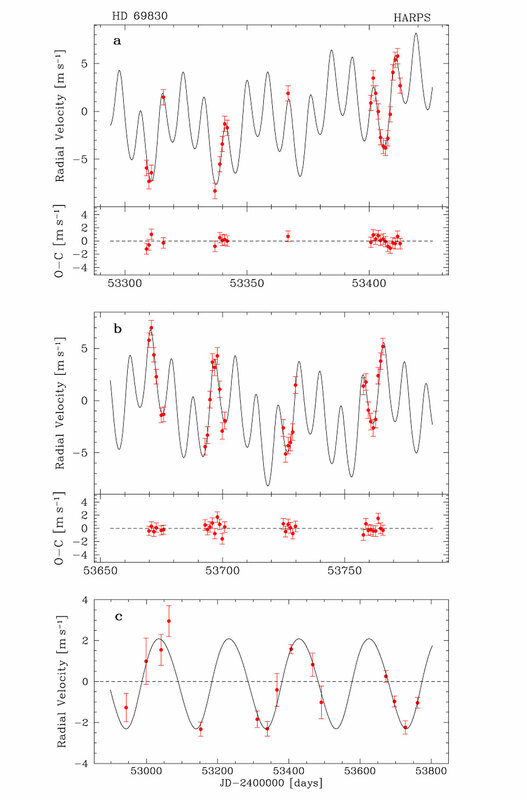 "Only ESO's HARPS instrument installed at the La Silla Observatory, Chile, made it possible to uncover these planets", said Michel Mayor, also from Geneva Observatory, and HARPS Principal Investigator. "Without any doubt, it is presently the world's most precise planet-hunting machine" . 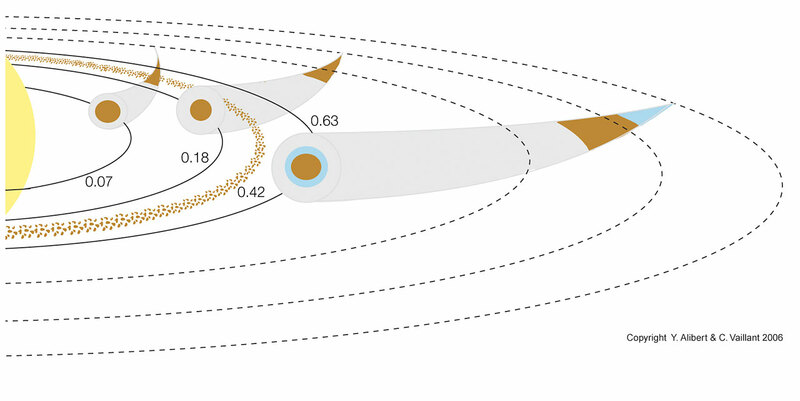 "This alone makes this system already exceptional", said Willy Benz, from Bern University, and co-author. "But the recent discovery by the Spitzer Space Telescope that the star most likely hosts an asteroid belt is adding the cherry to the cake." "The planetary system around HD 69830 clearly represents a Rosetta stone in our understanding of how planets form", said Michel Mayor. "No doubt it will help us better understand the huge diversity we have observed since the first extra-solar planet was found 11 years ago." High resolution images and their captions are available on this page. Video footage and animations are also available on this page. 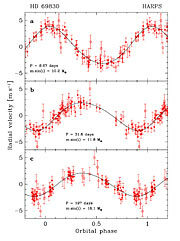 : These results appear in the 18 May issue of the research journal Nature ("Discovery of an extrasolar planetary system with three Neptune-Mass Planets", by C. Lovis et al.). The team is composed of Christophe Lovis, Michel Mayor, Francesco Pepe, Didier Queloz, and Stéphane Udry (Observatoire de l'Université de Genève, Switzerland), Nuno C. Santos (Observatoire de l'Université de Genève, Switzerland, Centro de Astronomia e Astrofisica da Universidade de Lisboa and Centro de Geofisica de Evora, Portugal), Yann Alibert, Willy Benz, Christoph Mordasini (Physikalisches Institut der Universität Bern, Switzerland), François Bouchy (Observatoire de Haute-Provence and IAP, France), Alexandre C. M. Correia (Universidade de Aveiro, Portugal), Jacques Laskar (IMCCE-CNRS, Paris, France), Jean-Loup Bertaux (Service d'Aéronomie du CNRS, France), and Jean-Pierre Sivan (Laboratoire d'Astrophysique de Marseille, France). : A planet in orbit around a star will manifest its presence by pulling the star in different directions, thereby changing by rather small amounts its measured velocity. 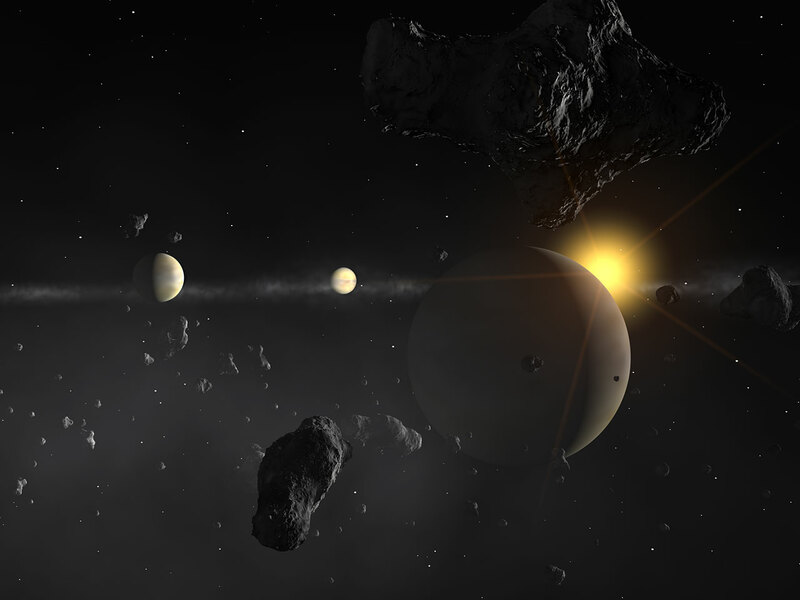 Astronomers therefore measure with very high precision the velocity of a star to detect the signature of one or more planets. 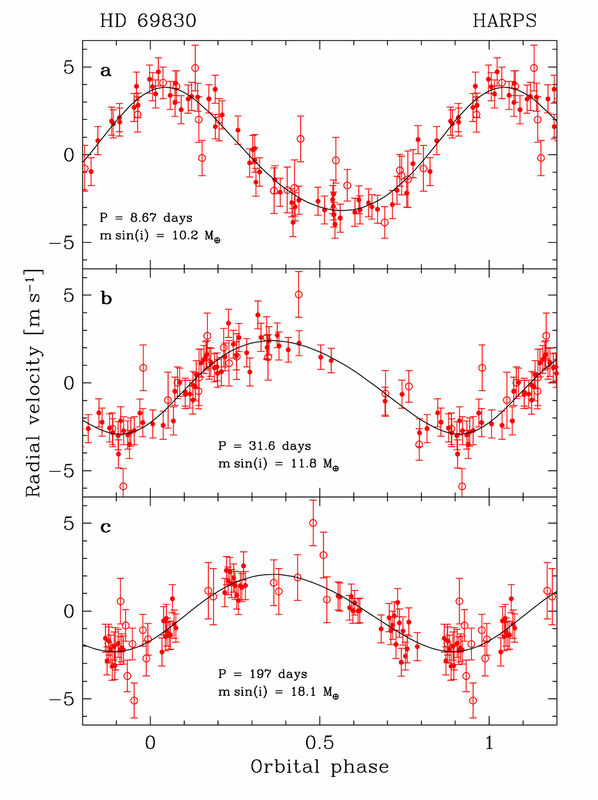 : The High Accuracy Radial velocity Planet Searcher (HARPS) at the ESO La Silla 3.6-m telescope is dedicated to the discovery of extrasolar planets. It is a fibre-fed high-resolution echelle spectrograph that has demonstrated a long-term precision of about 1 m/s.